What is all that mess about ? 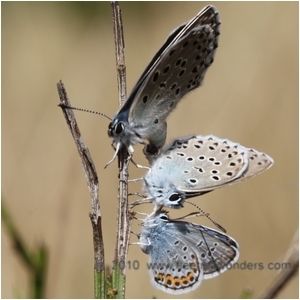 When visiting this dry grassland this pair of Large Blues (Maculinea arion) was found mating (female above) ; suddenly a male of Silver-studded Blue (Plebejus argus) arrived and started to fly frantically around the Large Blues... It was amazingly attracted to what was going on. The large Blues seemed to be quite disturbed by this weirdo which was not invited.. 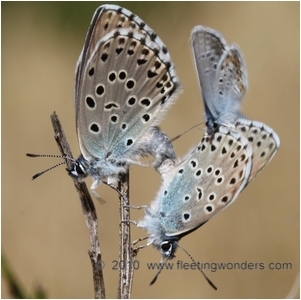 The small male did try to mate with the female, curving its abdomen and bringing its genitalia out (well visible on the picture on the right). 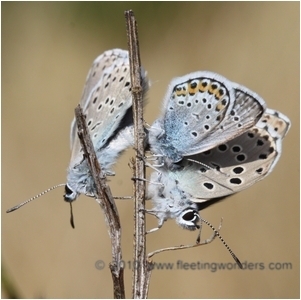 Finally the Silver-studded Blue gave up and left the Large Blues. This observation tends to prove that chemicals which are released by females are more or less specific since other species can be susceptible to them. This site really is a good place for both Maculinea arion and Plebejus argus. 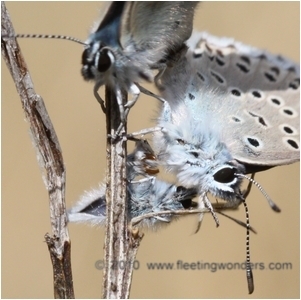 This habitat is also suitable for ants that are necessary for those two butterflies. 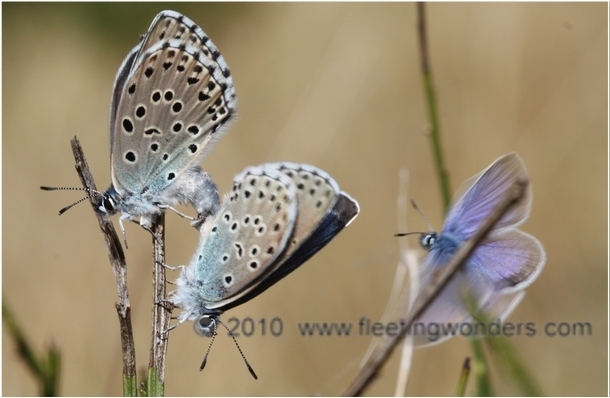 The Large Blue's foodplant (wild thymus) was abundant there in 2009 as well the butterflies themselves. 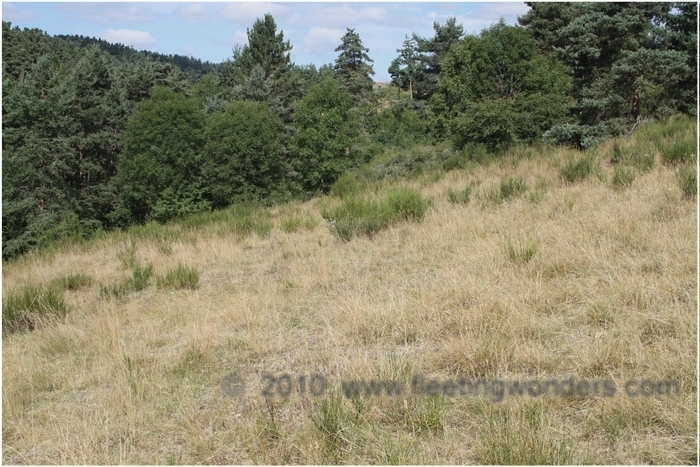 Some sheep are sometimes taken to this wide grassland ; they are left there for a short period, which prevents the vegetation from being totally destroyed. On the other hand sheep are useful and prevent the grassland from being colonized by bushes ; therefore their action appears to be positive only if it is mild, under control and somewhat monitored. 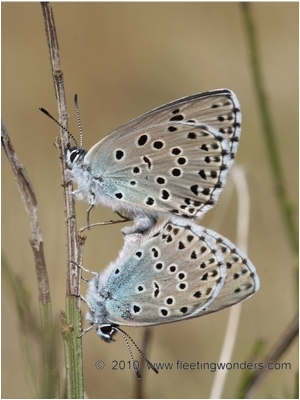 Provided this site remains non-intensively grazed, the Large Blue population will remain strong as well as ants population which is essential for this butterfly (Large Blue's caterpillars parasitize ants' nests and would not survive without them). If ever more sheep are set up here or stay too long on the grassland, the whole habitat will be damaged and this scarce species will disappear from the area. Unfortunately, this sad event often occurs because of human's ignorance and neglectfulness.